We believe it is the latter. Just as a car’s GPS system triggers a recalculation when a driver deviates from a current route, we believe investors are recalculating the probability that a potentially significant route shift in the big picture is underway. The pessimism reflects a “collapse anxiety” of sorts that still gnaws at the psyche of many, even as the distance from 2008 lengthens. Several high-profile economists and pundits are both frustrated and perplexed that initiatives like cash-for- clunkers, the $800+ billion U.S. stimulus program, and Japan’s 20 installments of government spending juice (over recent years) have failed to trigger anywhere close to the expected multiplier1 impact on economic activity. Like our GPS analogy, cars and equipment have been used as economic metaphors for at least the past century. One of the most influential economists of all time—John Maynard Keynes (1883-1946)—generally embraced the economy-as-machine perspective. As the “smartest guy” in nearly every room, Keynes rarely lacked self-confidence. When asked how to pronounce his name he quipped, “Keynes, as in brains”. This is not the first time that influential thinkers have pronounced the U.S. stuck in the “mature economy” ditch from which it cannot escape due to the perceived dearth of technological opportunities and slow population growth. The term, secular stagnation, itself was coined in the late 1930s by the Harvard economist Alvin Hansen—advisor to Franklin Roosevelt—and who became regarded as “America’s John Maynard Keynes”. Gloomy prognostications also were common in the 1970s due to perceived resource and economic exhaustion. We believe another plausible explanation exists to explain the current slow growth route and why a recalculation of future prospects is appropriate. As we have pointed out on numerous occasions since 2008, the accumulated experiences around the globe over time provide strong evidence—by our reckoning—that a tradeoff exists between economic growth and government intervention. This tradeoff is captured by a construct we have discussed previously—the Rahn Curve. 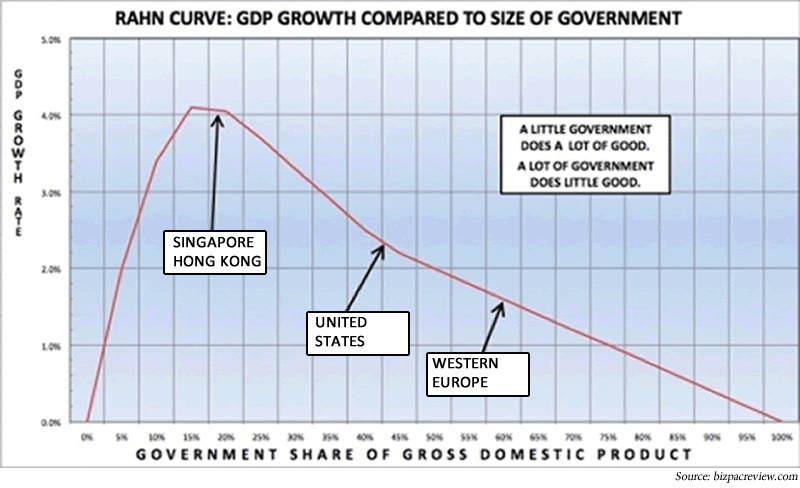 The Curve suggests economic growth (as reflected by Gross Domestic Product, or GDP) slows as the size of government intervention within the economy expands beyond a certain (tipping) point. The slow growth since 2008 (and 2000, for that matter) has not been a surprise as government economic intervention has expanded along the downward slope side of the Rahn Curve. The tradeoff exists, we believe, for several of reasons. When a government increases economic involvement, the productive private sector is displaced by the low productivity public sector. The displaced activity shifts the basis of economic resource allocation from what is a typically mutually-beneficial trade between willing parties to allocation by politics. Why is the private sector more productive than the public sector? In a word—competition. Constantly challenged by competition to attract and please customers and clients, the private sector is continually pushed towards the productive frontier. By contrast, low productivity is the norm in a public sector that faces little or no competitive pressure to constantly improve. Increased government intrusion also acts as a wet blanket on growth for other reasons as well. The economy is not in fact a machine but an ever-evolving organic process involving human beings. The human element means psychology is often involved. Much as helicopter parenting can stunt the growth of a child, too much government can stunt economic growth by distorting economic incentives, and encouraging risk-aversion by economic participants. How do excessive regulations stunt growth? As the Wallison quote above and the Sam? cartoon below suggest, an expanding flow of complex and nebulous regulations drives businesses to re-allocate precious resources away from productive initiatives towards compliance. Meanwhile, bigger businesses with deeper pockets also re-allocate resources towards lobbying efforts in hopes of gaining favored regulatory treatment and/or using regulations to limit competition. So, potentially, lobbying is beneficial. Within this context it’s not likely coincidence that (according to Census Bureau data) many of the wealthiest U.S. counties surround Washington D.C. Finally, as we have detailed on prior occasions (see for example What-dun-it? and Ant Man), strong economic growth and mass flourishing have occurred when governments have allowed economic freedom to expand. Once on the down-slope-side of the Rahn curve, increased government intervention in the economy tends to constrain economic freedom. Yes, the economy needs rules and regulations. And, yes, the Fed is important and played a critical lender-of-last resort role in the 2008 Panic that prevented a Great Depression rerun. But the bottom line is that policymakers cannot manufacture either economic growth or rising living standards via legislation, regulation or money supply and interest rate management. They can, however, either inhibit or pave the route for growth which emanates from the dynamism of the private sector. Corporate tax cuts and the significantly lighter regulatory touch being signaled by the incoming Congress and administration have the potential to pave the way for stronger growth. The earlier sidebar above briefly discussed J.M. Keynes. In addition to being a super-star economist, his results as an investor were exceptional over his lifetime. However, his investments got crushed during 1929-1932. This experience impressed upon him the importance of the human element of psychology within the economy and markets. He noted that private sector “animal spirits” that fuel optimism and risk-taking also help fire the economy’s magneto. 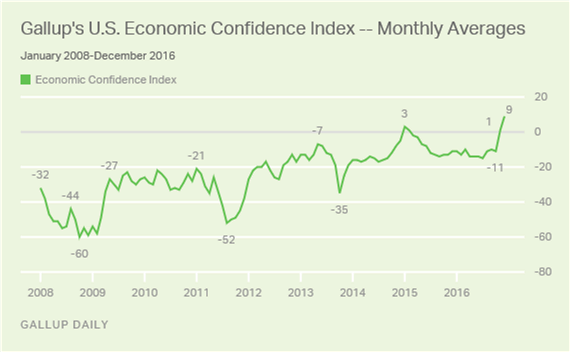 While the new administration’s economic initiatives are still taking shape and aspects remain unclear at this point (foreign trade particulars for example), corporate tax cuts and regulatory relief would materially lift both animal spirits and the wet blanket on economic growth. Why is economic growth important? If the economy grows at an inflation-adjusted rate of 2 percent, it will double in about 36 years. If it grows at 3 percent, it will only take 24 years to double. A double for the U.S. economy would significantly improve the standard of living for the next generation(s). And since tax revenues are a function of economic growth, it would also potentially go a long way towards defusing many of the long-run fiscal imbalances the country faces. Stronger growth and increased confidence can usher in an environment much different than what has prevailed in recent years. Anticipating this, investor expectations are right to be undergoing a big recalculation. We believe rising interest rates will be part of the big recalculation. Risk aversion and economic pessimism have flooded the bond market with investment dollars. This has pushed bond yields lower and bond prices higher—particularly in the “safest” bonds—Treasury securities. Stronger growth, revitalized animal spirits and increased confidence in the durability of the economic expansion represent serious challenges to the expectations of stagnation and fears of sinister deflation that appear built into the prevailing interest rate/bond yield environment. What determines the “price of money”—that is, interest rates? Figure 3 (above) we believe offers a worthwhile perspective on the relationship between interest rates/bond yields and the underlying economy. Recessions are denoted within the diagram by the shaded areas, by the way. While Fed policy certainly sets the tone for interest rate and bond yield levels in the short run, market forces ultimately drive the “price of money” over time. Market forces are largely determined by the pace of nominal (including inflation) growth of the underlying economy. With interest rates/Treasury yields below even the heretofore modest growth rates of the economy, upward pressure on yields is likely to emerge, particularly if growth and confidence pick up as we expect they can. A second key message of Figure 3 is that in those economic expansions where bond yields persisted below the underlying rate of economic growth—namely, the 1970s and the 2000s—serious economic trouble followed. In the 1970s the great inflation was the result. Sky-high interest rates and two recessions occurred before the Fed could finally break the back of accelerating inflation. And the unsustainable housing boom of the past decade—aided and abetted by Fed policy that kept rates too low for too long into the expansion—very likely contributed to the severity of the housing bust and the Panic of 2008. We believe these lessons are not lost on the bond market or the Fed. Rate/yield increases to close the gap between current levels and economic growth are likely. As always, context remains important. Rate and yield increases will likely remain within the context of still generally low-yield levels. While inflation may rise some, we don’t believe the economy is inflation-prone like it was in the 1970s. Nor do we believe unsustainable excesses like anything resembling the housing bubble of the 2000s are building within the economy (at least not at this point). Still, defensive positioning in terms of bond interest rate risk remains our recommended strategy. Stronger growth, lower corporate taxes and relief from red tape augur well for corporate earnings growth. 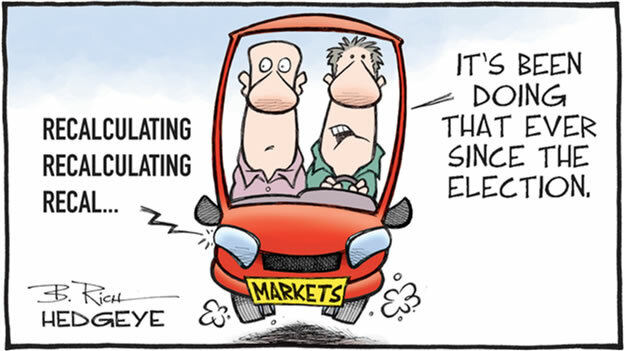 And we believe that over time earnings drive stock prices. We, therefore, expect the current bull market in stocks to grind forward still further. It won’t be a smooth ride upwards—it never is. Economic troubles abroad remain. Difficult and dangerous geopolitical issues exist. Angst about President Trump is likely to ebb and flow. Some worry interest rate/bond yield increases will kill the stock bull market, but that possibility remains some ways off in our estimation. As Figure 3 earlier implies, unless and until rates/yields exceed the growth rate of the nominal economy, they are not likely to choke off economic growth. Thus, rising rates/yields are occurring for the “right” reason—because growth is exceeding the expectations imputed in bond yields. How far can the bull market run? Traditional valuation metrics suggest stocks are not cheap. And as has been the case since the stock bull market began in 2009, price “corrections” can happen at any time. However, the real bull market killers are recessions. In recessions corporate earnings decline and balance sheets become stressed. Recessions, in turn, unfold as unsustainable excesses accumulate and rates/yields reflect financial liquidity is “tight”. Neither of these conditions appear present today or are on the immediate horizon as best we can discern. Constant re-evaluation is, of course, necessary. 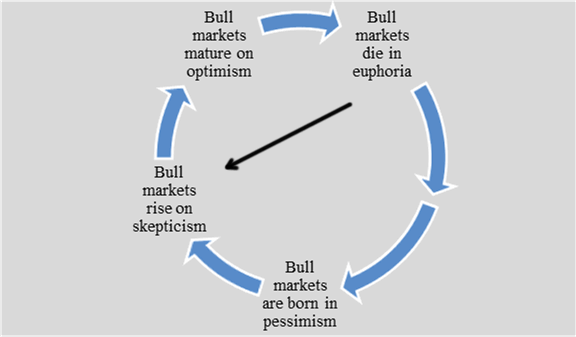 As a final indicator of the stock bull market’s status, we return to John Templeton’s bull market “clock” depicted in Figure 4 (below) that we’ve discussed on prior occasion. Since the bull was born in the pessimism of 2009, it has climbed a “wall of worries” and overcome the skepticism that has marked the prevailing route. With animal spirits awakening and a recalculation underway—as hard as it may be to believe—the clock will likely strike “optimism” sometime ahead. That will be the time to play serious investment defense. 1 A theory proposed by economist John Maynard Keynes’ theory that a $1 worth of government spending will trigger multiple dollars of spending within the economy. 4 Similarly, for so-called monetarists, variables that may have been constants in some economic conditions (the notion of monetary velocity for example) may become variable in nature under different economic conditions. Hence those that predicted hyper-inflation in the wake of the Fed’s extraordinary interventions have been wide of the mark. The Fundies Under →	← What-dun-it?